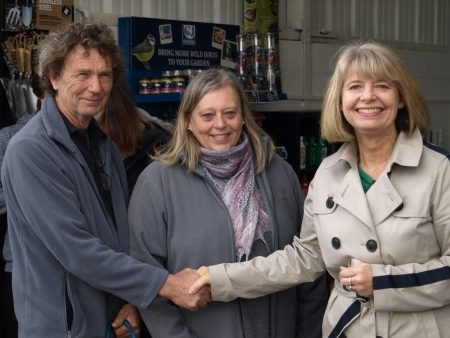 West Worcestershire MP Harriett Baldwin joined local people celebrating a fast growing garden centre based in Leigh Sinton. The MP was asked to cut the ceremonial ribbon on the new shop area offering extra space for customers as the owners, Andy and Rachael Mahy, continue to grow the popular business. Wykeham Gardens Plant Centre has opened the new shop after extra space became available next to the current site. The business stocks a wide range of plants, shrubs and trees as well as handmade products made by a local blacksmith. Harriett commented: “I was delighted to be asked to cut the ribbon on this new shop and celebrate a successful, growing business. “It is great to businesses like these thriving and creating new jobs and I was particularly impressed that they have taken on an apprentice. Photo: (l-r) Andy and Rachael Mahy, with Harriett Baldwin MP.